Chatting with the girls has Nanami realizing something shocking. Even when on the exact same diet â€“ down to identical portions â€“ she puts on weight far easier than Touga, who has no problem staying thin. Could it be that they are really not related? Or, maybe itâ€™s true what they say how boys donâ€™t get fat like girls do . . . which is even worse because thatâ€™s literally natureâ€™s misogyny! Unable to face Touga anymore, Nanami runs away from home to take refuge at the Chairmanâ€™s Tower. 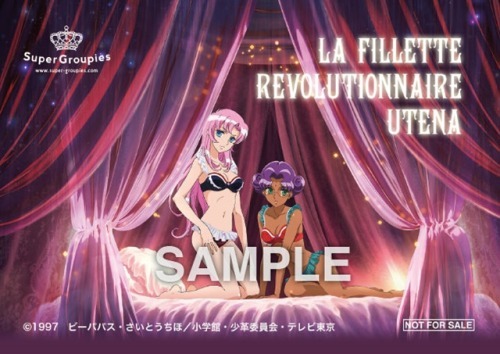 There, the competitive girl takes comfort at noticing Utenaâ€™s thickened waistline (that with her recent binging). All is well for her, until Nanami walks in on the Ohtori siblingsâ€™s late night binge-spree and is stunned. If Akio is prone to getting fat just like his sister Anthy, how is it that Touga manages to stay thin despite eating the same thing as her?! Akio and Anthy both binge; both are fat. Touga and Nanami both eat the same, yet one is effortless thin while the other struggles with fat. Again . . . could it be that the Kiryuus really ainâ€™t related? Turns out that Touga being taller and broader and far more active than Nanami gives him a much higher Total Daily Energy Expenditure (TDEE) than his sister. With the exact same diet, one eats healthily while the other overeats. Akio advices Touga to explain TDEE to Nanami, but Touga thinks its more fun to let his over-reacting sister continue to angst about the unfairness of it all. Could not have said it better myself. Jesus, lunaopheliac, can you Maybe chill? For the revolution of the world, I won't give up on love! Arale, of course "don't look don't read" is not a defense against criticism of a work's "artistic quality." Then again, if someone has no constructive criticism to give a work, but is just looking to bash something they're already biased against because of personal issues of their own making . . .
PS. Fic is SKU "parody," its contents inspired by various logic-defying fatlogic statements as spewed by certain people online. That said, if someone choose to interpret this as "fetish" then well, it's up to the individual reader. After all, many seems to think the original SKU LGBT elements are fetish-ized as well - and with valid reasoning. PPS. Please feel free to take a look at Seinen Kakumei if you're comfortable with what's in the warning. Just pointing out, the luna post is two years old. They got a little worked up, but they did not try to police or regulate anything written or posted. They complained, yes. They suggested a motive for writing the stories. But, "warnings," don't mean that no one can complain or criticize afterwards. PS. Fic is SKU "parody," its contents inspired by various logic-defying fatlogic statements as spewed by certain people online. That said, if someone choose to interpret this as "fetish" then well, it's up to the individual reader. "[T]hey're already biased against because of personal issues of their own making," and "inspired by various logic-defying fatlogic statements as spewed by certain people online," seems, to me, more than a little hypocritical. "[F]atlogic statements are spewed," isn't ever going to be anything except a personal bias, or personal issues, and other than "bashing," what are you doing with those? That term, alone, isn't ever going to be neutral, certainly. I tried, two years ago or more, to see the humor in this, to roll with the punches (I'm not even the target), but there is a clear target and how you're describing it in your own voice, outside of characters or parodic fiction, shows an agenda and a judgment. Which is fine, and not against any rules or anything, but it is open to criticism, perhaps even emotive criticism if you're going to open up the "conversation"/thread with what is almost entirely story-based highly-emotional criticism of others. DD, first thing first: why are some of the punctuations, especially the ( â€œ ) and ( â€˜ ) coming out as something like ( <?> ) on the posts where Iâ€™m looking? Is there some forum post syntax change Iâ€™m not aware of? Then, in reply to your post . . . it seems only appropriate for me to exit humor mode and reply in a more articulate manner, hoping nothing I write is to be distorted. And, in writing this post, I will have to quote whatâ€™s upthread. Please do not interpret it as though Iâ€™m trying to stir up old drama: I'm just trying to defend myself against certain things you seem to be accusing me of. Just pointing out, the luna post is two years old. Yes, the event was 2 years old. But Ikarikun was commenting on the 2 yr old postings just yesterday. Arale also wrote what Arale wrote yesterday. My last post was my thanking Ikarikun (I take their words as support) and also to reply to Arale. Let's be clear on that. They got a little worked up, but they did not try to police or regulate anything written or posted. They complained, yes. They suggested a motive for writing the stories. But, "warnings," don't mean that no one can complain or criticize afterwards. Looks like policing by way of â€œshamingï¿½ to me. Another mod has long since since addressed this. Ikarikun agreed with mod just yesterday and I posted in part to thank them. I sense a strawman and am now taking it apart. A) I had promised neutrality between siding with healthy/unhealthy bodies and ways of living. B) What constitutes â€œfatlogicï¿½ in my story are simply my personal biases. My fic takes a neutral stance between the dangers of undereating/overeating cause both are damaging. At no point did I even suggest Iâ€™m neutral between healthy/unhealthy bodies and ways of living. Why should anyone pretend healthy is just the same as unhealthy? And yes, my writing does â€œbashï¿½ fatlogic and even its opposite â€œskinnylogicï¿½ (see Mikage arc). I've even posted warnings for people easily upsetby body issues so they can stay away. I've done my part, mod. Personal bias/opinons donâ€™t decide whether a statement is fatlogic. It is only when a statement a) clearly defy known science/logic b) cause believers to resign to living a fattening lifestyle that a statement constitutes true fatlogic. Clear cut example: Some people can eat and exercise however they want and not get fat, while others eat nothing and are athletes can get fat. The above statement goes against known science and factual logic. Both biology and thermodynamics dictate being fat/thin has to do with the amounts of calories going in and going out of a person. In other words, the fat/thinlogics in my story are all real-logic-sound to me. If someone finds flaws with one of my in-story fat/thinlogic examples (aka itâ€™s real!logic instead of fat/thinlogic) they are welcome to point them out to me. All are welcome to show me the errors in my own logic/fact-checking, if such flaws actually exist. Educate me, as they say. Then, DD, how is it at all "hypocritical" for me to write what I write in this thread? Like I said up-post, people can complain about the "artistic quality." of the story. That's read and review. But, when someone â€œcomplain or criticizeï¿½ not about the story quality, but instead "suggested a motive for writing the stories," that's not a review to the story itself: that's already a personal jab at the author No author â€“ no one - is obligated to endure that in silence. , perhaps even emotive criticism if you're going to open up the "conversation"/thread with what is almost entirely story-based highly-emotional criticism of others. If by â€œemotional/emotive criticismï¿½ you mean â€œnon-valid criticism based on feels not facts,ï¿½ Iâ€™m certainly not the one in this thread guilty of such. Iâ€™ve written a story that a) remains logical until proven otherwise b) make no personal attacks against any actual human for the sake of humor. If someone come into this thread despite warnings and â€œact offendedï¿½ / â€œmake unwarranted suggestions of why I write this storyï¿½ then I can only assume they suffer from â€œpersonal issues of their own makingï¿½ and deal with them accordingly. A work's quality is open to criticism. An author's stance and person is not open to unwarranted criticism: it is certainly not open to the blatant shaming I've seen in this thread (see luna's quote in this post.) Anyone who cross these lines can expect rebuking because authors are people. Posts that support the harassing posts by non-reviewers will also be addressed. It's smart quotes doing it, I'm pretty sure. If your browser is set to automatically adjust the end of quotation to curve inward. I was saying that for the sake of others, who may not notice/have noticed, including Ikarikun, since they were responding two years after the fact. It's easy for a poster not to notice how long as gone between posts. Just clarifying it's "old drama." Again, I didn't mean "this is old" as a criticism of you (or of anyone), but as a polite reminder, particularly as not everyone in that conversation is even here any more. Aside from that, I still don't see where that poster attempted to police or regulate you, even though I do believe their criticism verged in being personally insulting, not that we don't have a long, sturdy history of accepting that, anyway, within bounds. I disagree. You are using emotional, judgmental language that does demonstrate your personal biases, and yet you don't want someone else to do the same. I'm sorry, but there is no objective, unemotional, nonjudgmental way to use "fatlogic," or to then parody or satirize it. Satire, by its nature, requires judgment. That's neither good nor bad, on its own, but if not hypocritical, it seems disingenuous for us, as a thread, at least, to accept that you can be emotional, judgmental, and exhibit personal bias in judging things, but that critics must not. Your fic may not "bash fatlogic," but the fact you're using the term and coupled it - outside your fic - with other leading and judgmental language does, y'know, show a judgment. And, not an objective or universal judgment, but one rooted in, yes, personal bias. Your fic, as a story, does satirize and mock a number of body types, eating disorders, and types of people. Which there's no rule against. But, this is open to criticism, and certainly open to just being pointed out. You wrote a story that exists, primarily, to make fun of certain kinds of people or their logic and that's fine, but by posting it, you have made it open to criticism, here, for that. A warning is just that, a warning. It will not prevent criticism. It should not prevent criticism. RE Personal bias/opinons donâ€™t decide whether a statement is fatlogic. It is only when a statement a) clearly defy known science/logic b) cause believers to resign to living a fattening lifestyle that a statement constitutes true fatlogic. Nope. "Fatlogic" is a leading and biased term, by its nature and the distinctions it makes. It is neither neutral nor apolitical. That does not make it good or bad, but to pretend that you, or anyone, can apply it neutrally is disingenuous. "Logic-defying fatlogic statements as spewed," is how you, yourself, framed what you are mocking or dealing with in the story. Those are not neutral or non-biased terms. "Spewed," is not a non-biased term. Your phrasing there, alone - and this is outside the realm of fiction - indicates a personal bias and judgment and is, beyond that, insulting. Which, is fine. You can insult "logic-defying fatlogic" people. I don't think that's against any rules. But, it is what you're doing. You don't say your friend, who says very smart things, "spews" those smart things. An author's stance and person is not open to unwarranted criticism: it is certainly not open to the blatant shaming I've seen in this thread (see luna's quote in this post.) Anyone who cross these lines can expect rebuking because authors are people. Posts that support the harassing posts by non-reviewers will also be addressed. Luna went too far. I think everyone has agreed on that. But, yes, an author is open to criticism. Any of us in this thread or on this board are open to criticism. Our words and our motives. Not insults, but criticism. Urg. That makes it even more inconvenient to post story type things here than before. Interesting. Can you cite sources to back up your above statement? For now, I'll just try and run this through with my own logical thinking. Biased is by def. "unfairly prejudiced" for or against someone or something according to Google. Is pointing out how a statement/belief is illogical/unscientific being "biased" against anyone or anything? As I've said up-post, I choose the Fatlogic examples in my fic and this thread to be those that I believe cannot stand up to fact-checking to begin with. What exactly ares my stories/posts "unfairly prejudiced" against? Falsehoods? People intentionally promoting known falsehoods? Remember, "bias" entails "unfairness". I also have no qualms about referring to the act of voicing falsehoods that the promoters knows to be false as "spewing" - which the "online people" I've mentioned upthread clearly do. but if not hypocritical, it seems disingenuous for us, as a thread, at least, to accept that you can be emotional, judgmental, and exhibit personal bias in judging things, but that critics must not. I don't get how you arrive at this conclusion. Let's look at what I've actually written. Unwarranted means "not justified" by google. Unwarranted criticism mean unjustified criticism, which is what I'm referring to here (see below for example). Any of us in this thread or on this board are open to criticism. Our words and our motives. Not insults, but criticism. I have indeed been emotional and judgmental when judging "things" like vague groups or their behaviors in this thread. I have not, however, single out any individual forum member to insult/attack the way i was personally insulted/attacked in this thread. I do not see how I am being disingenuous at all to say critics who give unwarranted criticism (a polite way to put it) ala luna should expect rebuke, when I myself have not sunk to the same level (personally- attacking-others). Posts that support the harassing posts by non-reviewers will also be addressed. I've merely stated that any critic who criticize an author's stance and person "can expect rebuking", which is completely different than me saying others are "not allowed" to criticize. What I mean is that if someone comes in her stating/insinuating me to be a _________, they can certainly expect that I will rebuke - not personally insult - as is my right. I do hope so. I sense certain "language" in-thread that seem to be "subtly condoning"/"partial towards" the old Luna posts, which I find troubling. If by criticism you mean criticism not personal insults or unexplained label-slapping then yes, that's fair. In every example you just gave, though, you're assuming that you are, without examination or proof, the irrevocable voice of reason and logic and the other side is wrong and stupid. On the very simplest, most basic level, I want you to add "logic" to the end of names, and see how it feels in sentences. Including your name. "DDlogic" and "shutinlogic." "I tried to talk with them, but they were using _____logic." "They started spewing _____logic, so I knew I'd never get them to make sense." Is there any time that "_____logic," would not sound condescending and automatically imply they were actually being illogical? Is there any way that's not a judgmental and condescending phrase? Which doesn't make it against any rules, but does leave it, and your story, and you as author, open to criticism or commentary. And, please, luna's post, while ill-advised, was not nearly as "shaming" as your story stacks up. Let's really not go there. You wrote a story to make fun of people with problems or lives you don't have. That's fine. Lots and lots of potential comedy in that. But, you are making of fun of people. You are making fun of real life issues and using teenage characters to do so. The entire point of your story is to make fun of people. And, please, luna's post, while ill-advised, was not nearly as "shaming" as your story stacks up. Let's really not go there. There is a difference in levels between me posting a story and luna bashing me for doing so. It's a difference that got Luna mod-warned 2 years ago; a difference you now appear to be willfully ignoring since re-entering this thread. The difference lies in "personal" vs "non-personal" attack/fun-poking. At no point does my story "personally" attack any "named" member(s) of this forum, least of all luna. Luna had "personally" attacked me because she - not me - decided to make this "personal." Her posts are not mere "criticisms", they are all rude assumptions that amounts to "personal" insults even by your own definition. And this forum do not tolerate personal insults, I assume? I don't mean to be harsh, but no one here has any obligation to conform to your determination of what's acceptable as humor. Other Mod was clearly addressing luna's police/regulating me back then. DD, are you now trying to say, 2 yrs after the fact, that Other Mod's statement back then was uncalled for? Seems to me youâ€™re being disingenuous here, DD. â€œwithout examination or proofï¿½ are strong words. You need to have something factual to back them up prior to using them. If you are capable of proving one fatlogic example I gave in this thread to not be logically sound then please do so. This will totally prove that what I deem as fatlogic cannot stand up to â€œexamimation or proofï¿½ . Do go on: prove yourself right, and me wrong. I am open to facts. Failing that, you are simply undermining factual logic â€œwithout examination or proofï¿½ yourself. Seems to me your hypocrisy is showing, DD. Words have both defintion and context. Letâ€™s see what started this recent post-surge. of course "don't look don't read" is not a defense against criticism of a work's "artistic quality." Then again, if someone has no constructive criticism to give a work, but is just looking to bash something they're already biased against because of personal issues of their own making . . .
DD then comes in with a number of posts framing me first as hypocritical. Upon my rebuking, as disingenuous. However, they appear to be guilty of both themselves. Such is my criticism against this seemingly hypocritical, disingenuous critic. You wrote a story to make fun of people with problems or lives you don't have. That's the problem with throwing out assumptions "without examination or proof". What makes you think I have never had weight/eating issues myself? Get your facts checked before making such statements about a named forum member, please. That's fine. Lots and lots of potential comedy in that. But, you are making of fun of people. You are making fun of real life issues and using teenage characters to do so. DD's wording seems to suggest that it is "not fine" for me to use fictional!teenage characters to showcase of real life issues. DD is entitled to their opinion. But I have to wonder: is DD trying to "police or regulate" what is or isn't "fine" for me to write? Policing and regulating both can be executed in veiled manners. The line is thin, and crossing it could have consequences. The entire point of your story is to make fun of people. So yes, "critics" can also be "criticized." On a related note, Revolutionary Fit Girl Utena is getting new update requests plus new fav/follows on FFnet. There'll be an update after I work more on Seinen Kakumei. But I have to wonder: is DD trying to "police or regulate" what is or isn't "fine" for me to write? Policing and regulating both can be executed in veiled manners. The line is thin, and crossing it could have consequences. Oh, yes. You caught me. Clearly, I was policing you. I was actively taking steps to stop you from posting. That's why, after my first response to you, I wrote to you privately, and said, "I hope what I'm saying doesn't feel like I'm just going after you. I tried to make it clear, you're free to have your opinions and of course we want you to post, and to post fics as well. I'm not trying to run you off, shame you, or halt you." Because I'm trying to police and stop you. That's why I kept reiterating that you had broken no rules, and that you were free to continue to post such fic. Because I was trying to stop it. That's absolutely how you stop things, by publicly announcing it's within the rules and by publicly and privately trying to reassure the poster that I want them to feel free to continue. Just like my story, the public posts here on the forum will speak for themselves. But I have to wonder: is DD trying to "police or regulate" what is or isn't "fine" for me to write? Policing and regulating both can be executed in veiled manners. I think I'm witnessing â€œstories transform" in action. "Stop" and "regulate" have completely different meanings. I did wonder if you were trying to â€œregulateï¿½ up-post. I never did have to wonder if you were trying to â€œstopï¿½ me. You did not stop me as I was not breaking forum rules. What you did instead was telling me what kind of writing is or isnâ€™t â€œfineï¿½ and/or ï¿½ open to criticismï¿½ , in a language that cast me and the story in a supposedly negative light. Is that policing / regulating? I don't know for sure; I can only "wonder." Or, you could just make a note that you aren't looking for criticism and continue to post. I'm open to valid criticisms if they have valid factual basis. Personal-attacks (should the mods allow them to show on this forum), labeling-slapping, assumptions without "without examination or proof" will be rebuked as per my right. I'm sorry I ever said people could criticize your story (but not insult you). I'm sorry I criticized it at all. Mostly, I'm sorry I let you rile me up with your vague jabs and condescension. No one came into this "looking to be offended." I wasn't even offended by it, I just don't think it's good. The most offended party in this thread, is you. The one making the most accusations is you. Your story, alone, is an accusation, or collection thereof, but so is your not so rhetorical question of whether I or others are policing you, or what punishments or consequences may follow. If it came down to you or me? Staying here? Posting? Anything? If you really want to push that threat of yours and see how the other mods decide, go ahead. Even if it was a real debate, a real consideration, I'd go and leave you this, even though I love IRG, because I don't want to run you off, and I don't want you to feel you can't post, within the bounds of the rules. But, I don't want everyone else to think, either, that you can't ever be disagreed with, that your posts can't ever be criticized, or argued with, because if they do, they're "regulating" you, and there will be consequences. You're free to post within the bounds of the rules. You're not free to throw around vague threats. Not to a mod. Not to any poster here. That's you regulating, or policing, and you know? You're not the police here. You're not even a court stenographer. In the future, please don't stick on a warning about content, and expect that to mean no one will ever, ever criticize your work or speculate on your motives. Just tell us, up front, "I don't want any criticism or disagreement about what I'm about to post." And, then, if someone does post criticism or disagreement, you, as a functioning adult on the internet, can choose to not read it. And, I as another hopefully functional adult on the internet, will know that it's not worth my time. I wonder . . . will this thread actually grow into page 3 with this post? Hmm . . . episode 34 allows for great parody potential. But there's so much content . . . I don't want it to end up disproportionally long versus the other chapters. Must find a way around this. P.S. Googled "rude assumptions" and came up with some sweet finds. Will try incorporating into fic. (//â€œI wonder, I wonder, do you know what I wonder? Multiple choice. Which of the following three things is actually biased? (//â€œI wonder . . . . Multiple choice again. Which of the following three actions is truly disingenuous? 1. Making rude assumptions about others with no facts to back it up. 2. Voicing scientifically proven facts. 2. Health shows voicing scientifically proven facts. Updated to EP 34 over at FFnet, where punctuation formatting is possible. Go there!